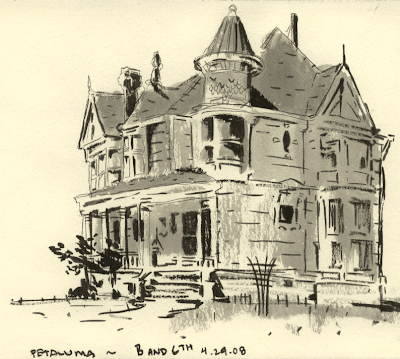 Took a short walk during my lunch break today and parked under a tree along the curb to sketch this old Victorian I've had my eye on. It's in dire need of some love - just the way like'em. lovely sketch - great feeling of an olde tyme home that is run down. creepy building. i like how you're able to get the form down with only a couple of lines. Mike, I hope one day you put these sketches together in a book (like the Black Frog's). is the gray just a wash or is it something else? i can't tell. Since you go exploring anyway have you been up to Point Reyes yet? It's really quite beautiful seeing unbroken (you know void of structures) green hills and cliffs down to the ocean. The ride is definitely a "bring dramamine" if you get car sick jaunt though. Hey Arkady, sorry I didn't get back to you earlier. The wash is just ink diluted with water. And one of these days I'll put out a book, probably on the indie level, though it'd be great if I could fool.... er, convince a publisher to put it out for me. Devon - Hi! I've been out to Pt. Reyes, but not exactly as far out as I'd like. I've viewed it from Tamales Bay/Dillon Beach I dunno how many times... hopefully I'll be on the other side soon. Rich and Scott - glad you both like the building -- I wanna make it our joint studio. You guys down? hehe.